M.K. Davis is well-known in the Bigfoot community for his video breakdowns and analysis of the Patterson film. In this video, M.K. stabilizes, enhances, and zooms in on Todd Standing's blinking Bigfoot footage. People have speculated that some of Todd's pictures and videos are actually Todd in a costume because of his facial features lining up with the alleged Bigfoot. Then again, this guy seems to have a lot of different looking Bigfoot on film. What do you think? 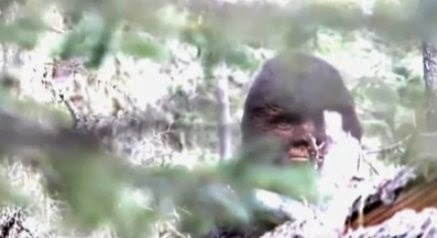 Real Bigfoot or another hoax? What's with the eyes? It looks like there's a second eye lid the moves right to left. Weird. the blink is odd...my brows aren't usually involved with a standard blink. Too overacted. Compared to a creature with similar brow structure (like a gorilla) the brow is not involved in a blink. there's to much going on for a simple blink. Try working for a living. BSA! That thing is for real!! MK Davis rules the sasquatch world!!!!!! Keep up the good work MK!! !